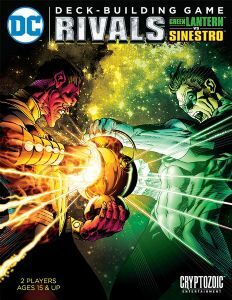 DC Comics Deck-Building Game: Rivals – Green Lantern vs Sinestro sets out to recreate the never-ending conflict between Hal Jordan and Sinestro. The 98 cards in the set include new heroes, villains, equipment, locations, constructs, and features two different approaches to play. The Sinestro side is built around attack and forcing his opponent to take bad cards, while the Green Lantern side prefers drawing extra cards and a strong defense. In more detail, players take on the roles of Green Lantern and Sinestro. Each oversized character card has a cost of 9, 12, or 15 and has a unique ability. As they are defeated, the characters grow in difficulty to take down, and their abilities also improve. Players start off on an even playing field with identical decks of cards. They then use the cards in their hands and special abilities to buy bigger and better cards. As the game progresses, each player's deck becomes unique, strengthened by their decisions. 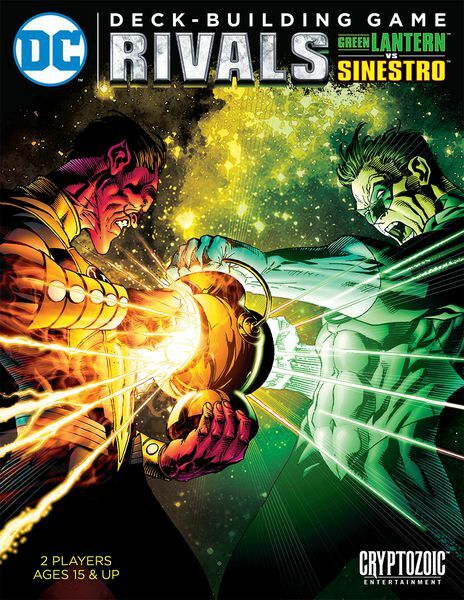 Players attack and defend until Green Lantern or Sinestro stands supreme over his iconic rival!